Recreation passenger boat Boot 3 with 50 people on board was evacuated after smoke came out of the engine room. The vessel was pushed by the port authority to dock in Burg vd Lelykade, where the fire officers were waiting to board and inspect the ship. The large smoke was estimated that originated from a ruptured cooling pipe, as liquids contacted with the hot exhaust, causing smoke. There were no danger for the people on board and no iriginal fire, but the passengers were disembarked and returned to Botlek by bus. 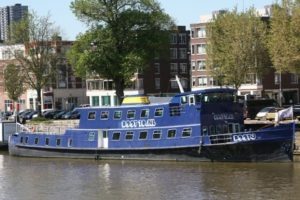 The vessel was detained at Burg vd Lelykade for repairs and special survey. Fortunately during the incident there were no reported injuries. The smoke caused some panic among the passengers, but no more serious accident. There are no reported damages to the boat and no water pollution. The recreation passenger boat Boot 3 has overall length of 46.00 m, moulded beam of 8.00 m and maximum draft of 2.50 m.